Listening a guided meditation sleep track nightly can vastly improve your life. Not only will you get better sleep from practicing mindfulness meditation exercises every night, but you’ll have a better waking life too. Read on to learn about the benefits guided sleep meditation can bring to your life. Why Should You Listen to a Guided Meditation Sleep Track Every Night? Sleep plays a crucial role in your well-being. To this end, a guided meditation while sleeping helps to relax your mind, allowing you to sleep more deeply. Additionally, sleep meditation is very flexible. There are no rules for how long you can meditate. Some people find it only takes ten minutes to clear their mind and fall asleep; others enjoy the process for longer. Stress is inevitable. No matter how much you want to keep a positive outlook all the time, there will always be issues that push you past your comfort zone. Still, while stress is inescapable, that doesn’t make it healthy. In fact, stress is the top reason people have trouble sleeping. To counter this, practice mindfulness meditation exercises and see how quickly you can reduce your stress levels. Sleep deprivation negatively impacts productivity. When you lack sleep, you have slower reaction times, impaired attention, and decreased memory retention, which all affect your performance and efficiency during the day. There are many ways that a lack of sleep can affect your weight. For example, when you don’t sleep well, your body releases hunger hormones that push you to eat more during the day. To make matters worse, because you don’t have a lot of energy, you also tend to exercise less, meaning you’re not burning those excess calories. Listening to a guided meditation track for sleep every night can help you avoid this problem by producing endorphins that drive away hunger. When your body is stressed, your hormones are out of whack. In fact, this is how most illnesses begin. Fortunately, because mindfulness meditation helps relieve stress, it also naturally reduces the risks of acquiring chronic diseases. Anecdotes and studies have shown that meditation can slow, and sometimes even halt, the progression of cancer, diabetes, and heart disease. Mindfulness meditation has amazing effects on the brain. Studies have shown that meditating daily can slow down the aging process of brain cells, reduce activity in the default mode network, and reduce symptoms of anxiety and depression. Best of all, if you practice mindfulness meditation through the help of a sleep track, these benefits feel like a gift each morning. When you meditate, you become more aware of your emotions, allowing you to detach from them. In short, you recognize that you are not your emotions, and your emotions don’t control you. To illustrate this, several studies have shown that people using guided meditations for anxiety report feeling a stronger sense of belonging and an improved quality of life. Isn’t that a great way to wake up each morning? Listening to a guided meditation sleep track not only improves your mental and emotional well-being, it also helps you get closer to spirit. Often, we seek answers to questions we already know the answer to. When you meditate, you may finally be able to see and accept those answers. Are you searching for effective guided meditation videos to help you sleep? Check out this free guided meditation by Jason Stephenson below. In this day and age, whether because of the internet or work, it’s easy to stay up too late. However, when you focus on getting good, quality sleep, you can take better care of yourself. 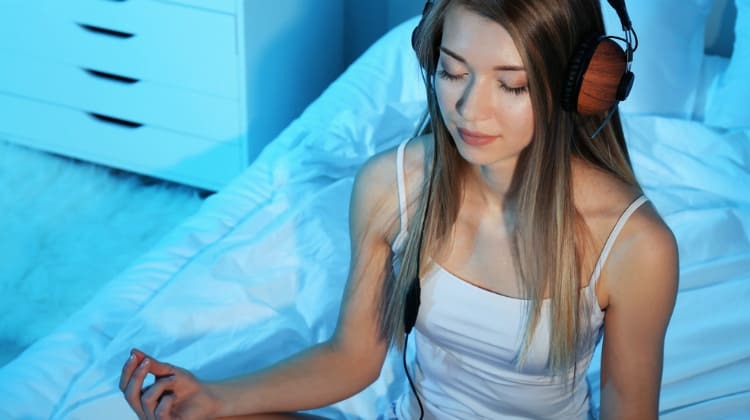 Listening to a guided meditation sleep track, even if it’s just for 10 minutes every night, will help you nourish your body, mind, and spirit. What do you think is the biggest benefit of listening to a guided meditation sleep track? Share your thoughts with us in the comments below.